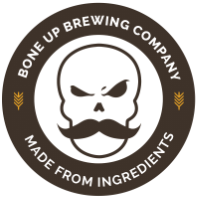 Stats: Serendipity - Bone Up Brewing Co. Brewers' Notes: Created largely by happenstance (with a smidge of laziness thrown in for good measure), this blend of barrel-aged and unaged beers got our tastebuds tinglin' the first time it touched our tongues, and we knew it would be downright foolish to look such a delicious accident in the eye and then walk away. And now you get to have some too!